Do you have any questions, requests, or comments? Please get in touch. You can find us at the heart of Heidelberg, near Bismarckplatz. Centrally located, our hotel offers the perfect starting point to see the sights of the city of Heidelberg, the university in the Altstadt and the Kongresshaus Stadthalle, which are all only a few minutes’ walk away. You can use the route planner to easily find the best way to reach us. You can book directly via Deutschen Bahn AG. Heidelberg’s central station is only five minutes away from the hotel by taxi. 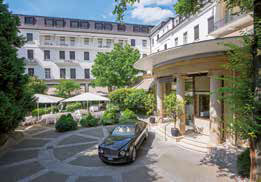 A newly renovated parking garage is located directly at the Hotel Europäischer Hof in Heidelberg, where you can safely park your car. The parking garage at the centre of Heidelberg, just at the edge of the Altstadt is the ideal starting point to visit the many tourist attractions, shops, and restaurants in Heidelberg’s old town. Upon arrival, you are welcome to drive right up to the hotel entrance. We will then be happy to take your luggage and park your car for you. Our 165 employees (including 40 apprentices) are here to serve you with passion and dedication. Their excellent hospitality allows for an extraordinarily high level of service. Here, personalised service is important to us. We are proud of this philosophy and of our team. Our credo: WE LOVE WHAT WE DO. You have questions, suggestions or a booking enquiry? You can easily contact us using this form. We are glad you are interested and will get back to you as soon as possible.